The sofas and recliners he sells may be perfect for relaxing on a Sunday afternoon, but Larry Klaben rarely rests. Since taking over a hometown furniture store in Dayton 14 years ago, Klaben has never stopped working to grow Morris Home Furnishings and turn the company into a household name. After graduation, Klaben moved to Washington, D.C., where he worked for two congressmen and earned a Master of Public Administration from American University. He also started his own company—Congressional Computer Management Services, Inc.—which provided technology and data services to political offices and nonprofits. After selling his company to an international software firm, Klaben moved back to Dayton in 1986 to help his father-in-law, Bert Leiberman, improve technology for his family business, Morris Furniture Company, Inc. Klaben was named the company’s vice president of operations and soon found that he excelled in the job. Just three years later, Klaben was named Ohio Furniture Retailer of the Year by the Ohio Furniture Representatives Association. Klaben purchased the company outright in 1998, becoming its CEO and president. To help him guide the Morris Furniture Company, Inc., he formed a committee made up of Morris executives and individuals outside the business. Klaben and his team redesigned the store layout into 10 unique showrooms organized to match customer needs. They worked to stay current with industry trends and the ever-evolving tastes of consumers. One of Klaben’s major goals was to grow the company’s market share in the Dayton region. To do so, the executive committee developed an aggressive plan for expanding to multiple locations. Growing from a single store in Dayton, Morris now has 13 locations throughout the Dayton, Columbus, and Cincinnati markets. That includes nine Ashley Furniture HomeStores and four Morris Home Furnishings stores. There are also four Morris Big TV Stores within the Morris showrooms and Better Sleep Shops in all 13 Morris and Ashley locations. Yet the biggest castle in Klaben’s kingdom is Morris’ new retail complex in Cincinnati. Opened in 2011, the Morris Home Center combines five distinct stores in an almost mall-like format. Customers can visit a Morris Home Furnishings, an Ashley Furniture HomeStore, and a Better Sleep Shop, along with a Morris Back Room clearance outlet and the company’s first Morris Big TV Store. While each store has its own entrance, the building’s interior floor plan is open to encourage customers to shop all five Morris brands. The concept has been so successful that the company opened a second Morris Home Center in Florence, Kentucky, this past June. 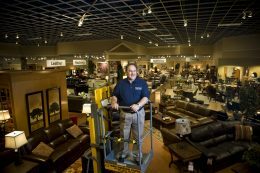 With annual sales of more than $75 million, Morris Furniture Company, Inc., has grown into one of the largest privately owned furniture companies in the state. The industry is taking notice. Morris was named the National Home Furnishings Association’s Retailer of the Year in 2008 and was included in Furniture Today’s Top 100 list of furniture stores in 2010. Supermodel/actress Cindy Crawford recently chose Morris to be the exclusive retailer of her furniture line in Ohio. Another focus for Klaben is using his company to serve the Dayton region. Morris supports a number of charitable causes including Dayton Children’s Medical Center, The Epilepsy Foundation of Western Ohio, AIDS Resource Center Ohio, Culture Works, The Human Race Theatre Company, and Daybreak emergency shelter for runaway and homeless youth. Morris also works closely with Secret Smiles, a nonprofit organization serving needy children in the Dayton area. To date, the program has helped over 2,200 children. “I tell my staff that we’re fortunate that our customers continue to buy from us,” said Klaben. “We need to support them in turn, and giving back to the communities they live in is a way to do that.” Klaben focuses the company’s charity efforts on education, health, and the arts—all areas that affect children and families.